In the post James L. Brooks on Chayefsky, Brooks is quoted as having great admiration for Chayefsky’s monologues in Network and Hospital. This is what screenwriter and former USC professor Irwin R. Blacker had to say on the topic of speeches in book The Elements of Screenwriting (which was first published in 1986 shortly after his death). There was no need for a speech against was in All Quiet on the Western Front. There was no need for a speech against vigilante justice in The Ox Bow Incident. There was no need for a speech against money-making evangelicalism in Elmer Gantry. So even if Chayefsky and Shakespeare pulled off big speeches doesn’t mean that most writers should or can. I’ve never watched Network (1976) and Broadcast News (1987) back to back, but that would be an interesting experiment. James L. Brooks, writer/director of Broadcast News, has been open about his admiration of the Oscar-winning writer of Network. Last week I watch the Criterion Collection DVD of Broadcast News that was written and directed by James L. Brooks. Despite the 1987 film being Brooks was nominated seven Oscars and not winning any, I think it is one of the finest films of the 80s. And almost 25 years after it was released, it is still a screenwriting and acting feast. And it was that fluke that helped serve as the foundation for Broadcast News. May we all be blessed at least once in our lives with a fluke of ours resulting in something one tenth as good as Broadcast News. Kickstarter update from Day One (July 25,2011): Well, the first few hours after my launch were a little rough–$00.00. (One of those moments when you stop and think, “If I delete this now, will anyone notice?) But Kyle Pukas and Daniel Yu stepped to the plate and the Kickstater really got started. Thank you Kyle and Daniel. If you’d like to help Screenwriting from Iowa..and Other Unlikely Places become a book then click here. Screenwriting from Iowa —The Book? After 3 1/2 years of writing this blog I’ve totaled over 300,000 words and have edited the best material down to a tight 65,000 word manuscript. But there are few steps that I need help on before this book can become a reality, and I have a short time to and raise the money through Kickstarter. If you can join me a little further down the road of this jouney, that would be appeciated. It’s been a heck of a ride. 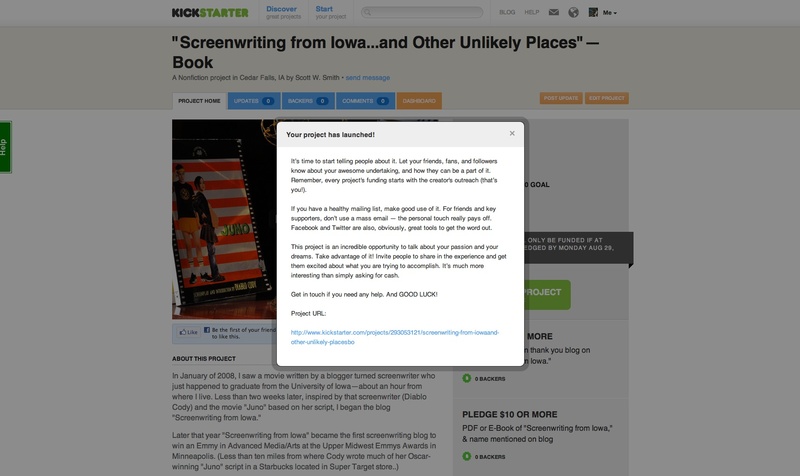 Visit Screenwriting from Iowa at Kickstarter to learn more about the book project.